In 30 days President Trump's former lawyer and fixer Michael Cohen is scheduled to report to prison to serve a three-year sentence for, among other things, defrauding banks and evading taxes on $4,134,051 in income between 2012 and 2016. In a new letter to Congress asking lawmakers to help keep him out of jail, Cohen's media-friendly lawyer, Lanny Davis, said his client "is going to prison for conduct almost all of which was for the benefit of Mr. Trump personally and indeed directed by him." Davis did not explain how Cohen's bank fraud and failure to tell the Internal Revenue Service about $4,134,051 in income from his lucrative taxi medallion business was done for the benefit of Donald Trump personally, nor did Davis explain how Trump directed Cohen to commit those crimes. The crime which prosecutors say Trump did direct Cohen to commit, a campaign finance violation stemming from the Stormy Daniels payoff, is often punished by a fine. Beyond that, even if one accepts Cohen's shaky claim that Trump directed him to commit yet another crime, lying to Congress, others convicted of lying in the Trump-Russia investigation have been given very light sentences. Former short-term Trump campaign aide George Papadopoulos was sentenced to 14 days. And yet Cohen somehow got three years, which despite Davis' argument might be related to his convictions for defrauding banks and hiding $4,134,051 from the IRS. In any event, Cohen has now come up with a new scheme to avoid going to jail. In a letter to some House Democrats, Davis said that Cohen, who swore to tell the "whole truth" during congressional testimony on Feb. 26, 27, 28 and March 6, has now discovered more truth to tell. And Cohen will be happy to tell it to Congress if lawmakers can convince federal prosecutors in New York to "substantially postpone" his date to report to prison. Davis told Democrats that "only recently" was Cohen "able to access" a computer hard drive which Davis said contains over 14 million files of "important documents." Davis did not explain how it was that Cohen only recently was able to access the drive, but it might have something to do with the drive being seized by law enforcement and used for prosecuting Cohen. Now that the prosecution is over, Cohen is, according to Davis, going through the files himself -- he has only been able to read 3,500 so far -- and he wants Congress to know what prosecutors have known for a long time. But he needs help. "Mr. Cohen needs time, resources, and assistance to separate out privileged and personal documents from these 14 million files to make the rest available for review by various congressional committees that have sought his help in fulfilling their Article I oversight responsibilities," Davis wrote. "Mr. Cohen is prepared to do so — but it will take time, effort, and ready accessibility to members of Congress and their staffs to assist in providing the relevant documents." And how could Cohen do that in jail? Better to let him remain free, phone in hand, ready to talk to Congress at a moment's notice — not for himself, but for Article I of the Constitution of the United States. 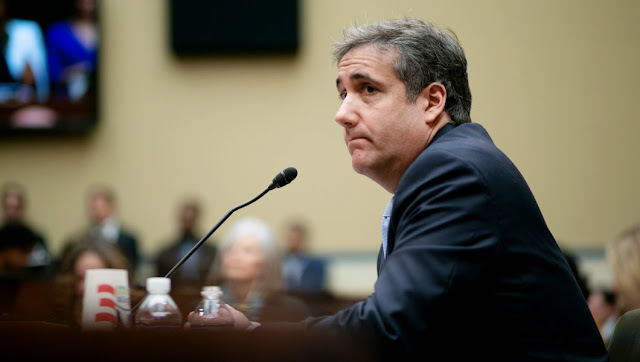 Davis drove the point home repeatedly: "Mr. Cohen needs to be readily accessible and immediately available to provide ongoing assistance to Congress in order for it to fulfill its executive branch oversight responsibilities," he wrote. The Cohen team hopes Democrats will help those prosecutors in New York "recognize the need for Mr. Cohen to be readily available to Congress." Davis noted that he sent the letter only to Democratic lawmakers because Republicans don't seem interested in hearing more from Cohen. The true situation is even worse. Not only are Republicans uninterested in hearing more, they are actively working to make sure Cohen, who has already pleaded guilty to lying to Congress once, will be prosecuted for lying again during his testimony in February and March. Cohen is sure to be among the people House Republicans refer to the Justice Department for prosecution for false testimony in his latest appearances. So Cohen's hopes, such as they are, lie with Hill Democrats. It seems farfetched to believe that prosecutors and a court would decide that Cohen should not go to prison for tax evasion and bank fraud so that he can stay close to House Democrats. But that's all Cohen has at the moment.